My best friend has suffered from a persistent, recurring cough for several months, and traditional medicine had no answers. Having had similar problems with a chronic sinus condition which flares up in the winter, I gave her my bottle of Aromata’s Eucalyptus Essential Oil to add to her aroma diffuser, just a few drops to be vapourized for several hours each day. The oil is protected in a dark glass bottle which preserves its active properties over time and is easy to dispense through the integral dropper under the cap: no spillage, no waste, no contamination. This is a top-quality, therapeutic-grade essential distillate, not a perfumed diluted product, so a few drops at a time is all that's needed. Like other essential oils, Eucalyptus Oil has many beneficial properties and can also be used topically to improve circulation, massaged into the skin undiluted or mixed with a few drops of carrier oil such as hazelnut or coconut oil. Although sceptical at first, my friend really liked the scent of the oil from the minute she opened the bottle and continued to enjoy it as the diffuser sent mist into the air. As is normal, after a period of time, she became accustomed to the scent, but she found that she only had to walk out of the room and return to pick up the scent again and know that the oil was still sending its therapeutic vapours into the air. I agreed to try this product in order to evaluate it and prepare a review, and am very glad that I had it on hand to pass to my friend in need! Since she was so happy with it, I also gave her my bottle of Aromata Tea Tree Oil, to add to the aroma diffuser mix to clear the congestion and boost her immune system. I am very happy to say that she is no longer coughing! Lavender is sometimes referred to as a "first aid kit in a bottle". It has many homeopathic uses, but is perhaps best known for its calming and relaxing effects, for treating restlessness, insomnia, nervousness or anxiety, depression, and even high blood pressure. I started using Lavender Oil to improve my sleep. I rub a drop on the inside of each wrist when I go to bed and it seems to help with relaxation, and shortens the amount of time I have to wait before falling asleep. It is also a great option to apply on any small cut, abrasion or burn to soothe the pain and reduce the scar when it forms. It is one of the few essential oils that can be safely applied to the skin without diluting. This oil comes in a dark glass bottle to protect it from light degradation and preserve its active properties over the long term. With the integral dropper under the cap, you can dispense it with precision avoiding spillage, waste, and especially contamination. This is a top-quality, therapeutic-grade essential distillate, not a perfumed diluted product, so it is effective in small quantities, just a few drops at a time. I have tried several brands over the years and this one is up there with the very best. It's the real thing, and costs a lot less than at my local pharmacy. I received a sample for review purposes, but will buy from Aromata again because of the absolutely top quality and purity of their oils. A whiff of this oil as you open the bottle is like smelling a freshly peeled orange. That’s no surprise since it is 100% pure, cold pressed from orange peel. The clean, citrus scent of orange oil might be its most appealing characteristic and hence is used in many cleaning and personal hygiene products. Try adding a couple of drops to your own unscented products. A drop combined with your face cream will enhance its effect by encouraging collagen production, reducing puffiness and facilitating the release of toxins (good for acne conditions). If you like to relax in a hot bath, add 3-4 drops of orange oil to enhance the experience (no more than 4, however, as it can be irritating to the skin). And, of course, you can use it in a diffuser to spread the aroma throughout a room. One of the main benefits of orange oil is to relieve anxiety and put one in a positive mood, but it is also greatly beneficial, in winter especially, to combat respiratory problems. In aromatherapy it combines particularly well with spicy oils like cinnamon, clove, nutmeg, and rosewood, and intense ones like cypress, juniper, jasmine, and frankincense. The dark glass bottle that this oil comes in protects it from light degradation and preserves its active properties over time. The integral dropper under the cap allows easy and precise dosing and ensures that the oil remains free of contaminants. It is important to stress that this is a top-quality, therapeutic-grade essential distillate, not a perfumed diluted product, so all you need are a few drops at a time. I'm glad I had the opportunity to test this excellent product in exchange for an honest review. Some orange oils are harsh and others too sweet. I will buy this brand again because of its purity and beautifully balanced aroma. I accepted a sample of this oil to evaluate and review, as luck would have it, at a time when my best friend was suffering from a horrible, persistent cough that would not go away. She saw her doctor, of course, and tried all the traditional medicinal remedies, but the cough kept coming back. Since I've had very good results with essential oils when dealing with a chronic sinus condition I get in the winter, I proposed my bottle of Aromata Tea Tree Oil (along with their Eucalyptus Essential Oil) to use in her aroma diffuser. I asked her to add a few drops of each to the water and keep the vapour going for several hours each day. Although sceptical, she agreed to give it a try and really liked the scent of the oil from the very first whiff. To my delight, the combination of these two powerful antibacterial and decongestant agents has completely cleared up my friend's coughs and she can sleep again at night! 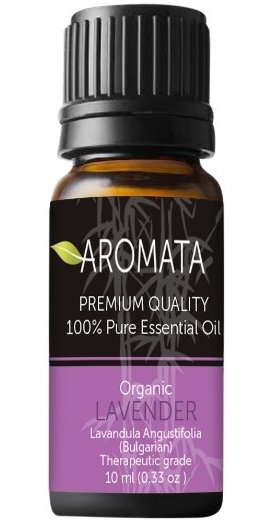 Aromata's oils are protected in dark glass bottles which preserve their effectiveness over time and they are easy to dispense through the integral dropper under the cap: no spillage, no waste, no contamination. Their oils are top-quality, therapeutic-grade essential distillates, not perfumed diluted solutions, so a few drops at a time is all that's needed. One of the most powerful and versatile essential oils, Tea Tree Oil has a full range of beneficial properties, including antiseptic, anti-fungal and anti-viral. It can clear up cold sores, warts, burns, and acne and kill air-born germs when used in a diffuser. Used undiluted, or added to a carrier oil like hazelnut, it can be massaged on the skin to improve circulation and boost the immune system. There are so many uses for it, these are just some examples. My friend and I can happily recommend this excellent product.